I had to travel out of town again for business. Before I left, I took 30 minutes to through together this card and am now up late at the hotel posting it. There are a few challenges out there using bunnies. This is a mini 3"x 3" card. The secret to doing this super duper quick card is to have a stash of die cuts ready to pull out at any time. Fortunately, I had a bunny in the stash. It was a duplicate from the spring card post here. When cutting a shape for a project, why not cut extra to have on hand. I started to do this and have a very mini stash started. So this morning, I grabbed some shapes and glues them down. What I have learned is I really need to build up this stash. makes it so quick and easy to make a quick card. Frame and circle were left over pices from other cuts form other projects. Base of card is 6"x3" when folded is 3"x3"
This card is adorable....I love that it is not stamped, gives me many ideas =0) thanks for playing along at Daisy Doodles Challenge Blog. Very pretty card! Thanks for joining us at Cooking With Cricut! Beautiful card! I love the soft colors! Thanks for playing at CTO! Pretty little card, I love that bunny. It looks good enough to take a bite out of...lol. Great card. I love that bunny cut. Thanks for playing along with us at Cooking with Cricut. This is an adorable card. Thanks for playing along at CTO. Cute card, Barb! Love the soft colors in your little scene. 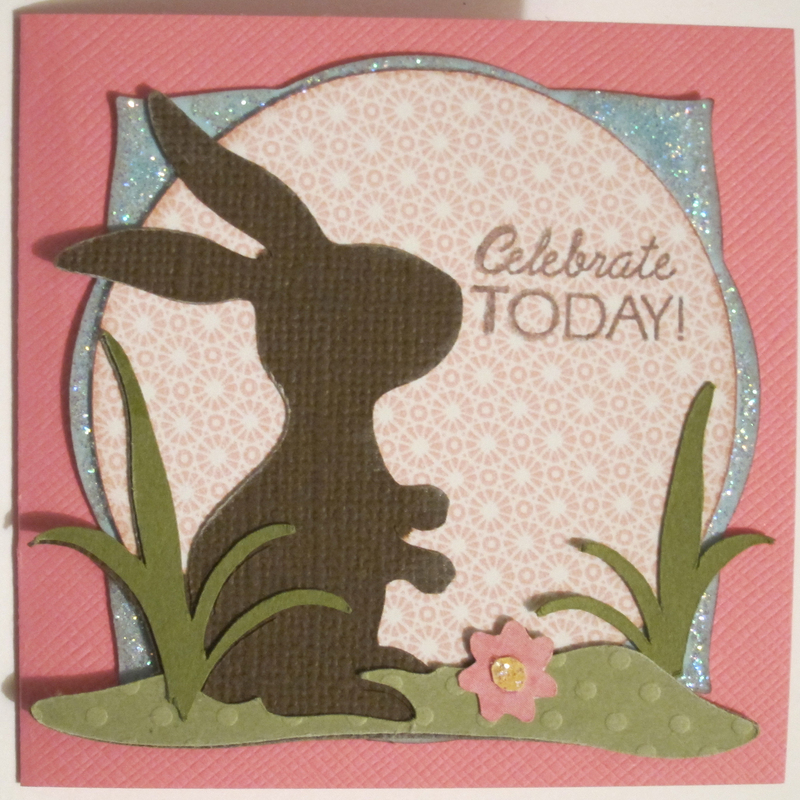 Thanks so much for hopping along with our Bunny Hop at Cooking With Cricut. Awesome card!! i just love this cartridge too:) A lot of fun cuts on it. Thanks for sharing! Good luck in the challenge! Cute, love this cart, thanks for Celebrating the Occasion! Lovely Silhouette and a BEAUTIFUL card! Great job as always! 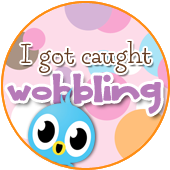 I have an award waiting for you on my blog! TFS! 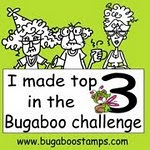 Awesome card for the Easter challenge at Daisy Doodles. Thank you for joining us this week. So sweet! I am so happy to hear my quick tip was useful! 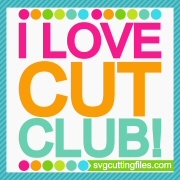 I love my stash of cuts! Barb this is really lovley! and i love your blog too!!!!! I love making 3x3 cards and that tip to keep cuts in your stash is really great! I sure love this bunny! It is adorable! Thanks for celebrating the occasion with us this week! Safe Travels! I love your card, Barb!! It's adorable!! Great job on the CTO challenge!! Really pretty card! I love the your tip. I will definitely do this too! Thanks for joining us at CTO! Thanks for sharing and playing along with us at CTO!! Very pretty card, great job! Thanks so much for Celebrating the Occasion with us. 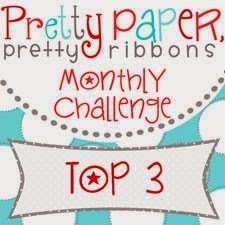 PS I'm in a blog hop this weekend and will have some candy to giveway I hop you are able to stop by. A bit of Spring for my window sill. FCCB Cricut Crawl- Still time to join in. Sand and sun can only mean BEACH. Spring Fling! Fantabulous Cricut Crawl! 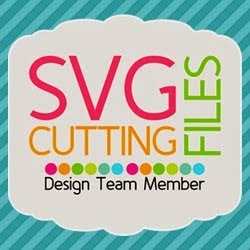 Playing with some SVG files!! Girl Power - Guest Designer!